For some reason the spaghetti squash had eluded me until very recently. This winter has been all about discovering new gourds and root vegetables for me, and the spaghetti squash was number one on my list. 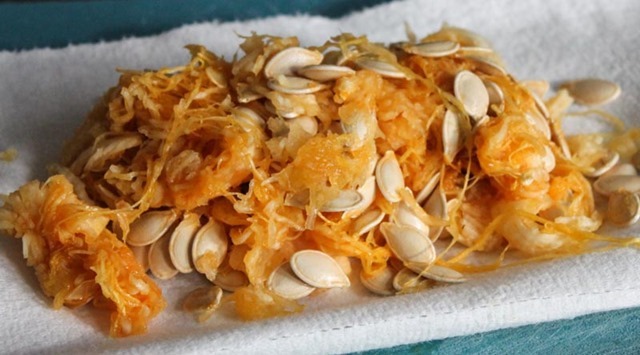 Spaghetti squash is velvety and buttery like most squash. It also is high in folic acid, potassium, vitamin A, and beta carotene, and low in calories (about 42 calories per cup). Ah, the spaghetti squash. What an awesome freak of nature. Looks like a plan old squash, right? Wrong! On the inside is something truly awesome, but you have to roast it up first to see what it is. We’ll start by cutting the spaghetti squash in half. Sounds easy but the spaghetti squash has a really tough skin that can be extremely hard to get through if your knife isn’t crazy sharp. I have read online that you can roast the thing whole but I haven’t tried it since my Shun chef’s knife has made cutting it in half bearable. 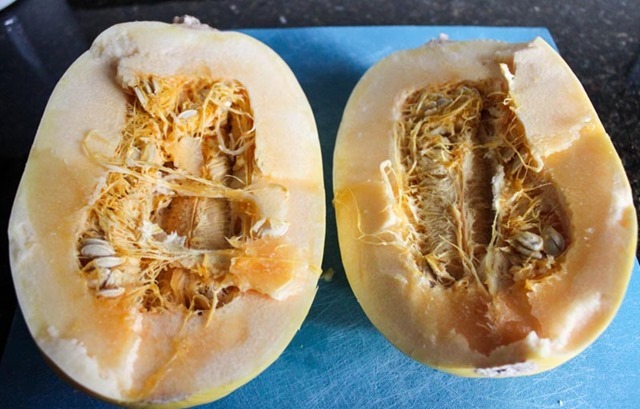 Once the spaghetti squash is open, scrape out the seeds with a spoon. 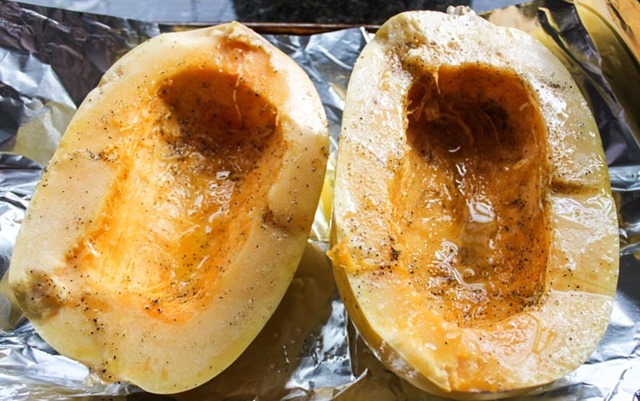 Next drizzle with olive oil, salt, and pepper, and give the spaghetti squash a good rub down – making sure that the entire surface is coated evenly. Roast on 400 degrees for an hour and a half. 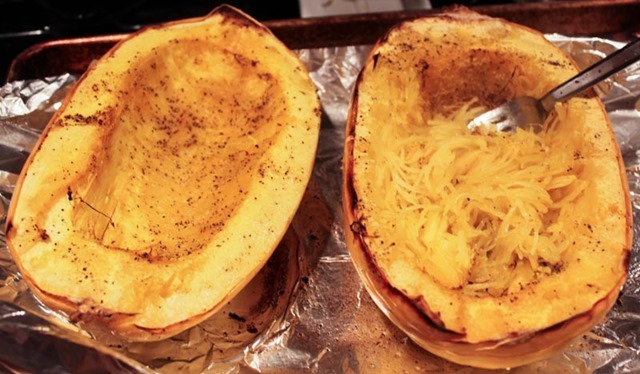 This is another thing I love about the spaghetti squash – you just let it roast and walk away. No checking, no turning, no temperature taking – it couldn’t be simpler. I love foods that don’t require babysitting while cooking. When the spaghetti squash is done roasting, let it cool for 10 minutes. Once it has cooled begin to pull the flesh away from the skin using a fork. 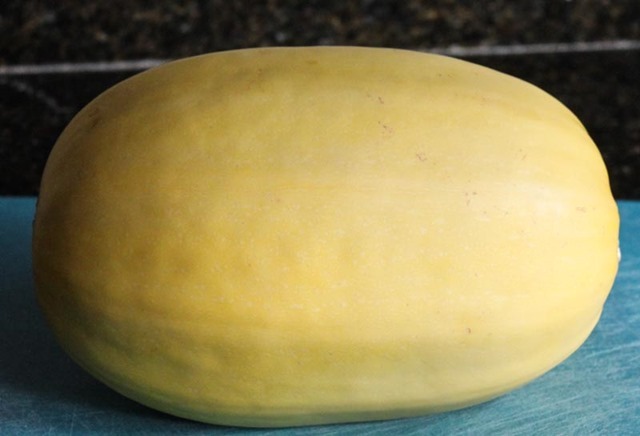 Here you will discover the wonders of the spaghetti squash! The texture looks and feels exactly like spaghetti! The taste is obviously different with the squash being buttery and light, however the starches are vaguely pasta-like. So cool and so strange. Another cool thing about the spaghetti squash is that it’s totally foolproof. 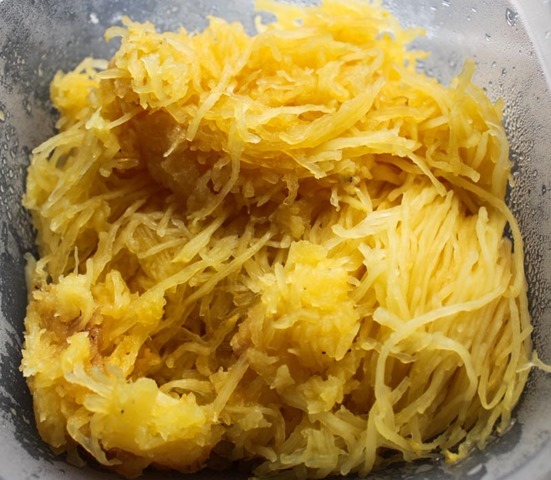 Unlike getting the perfect al dente texture on pasta, the spaghetti squash seems to come out perfectly every time. No random underdone-ness or overdone-ness, just perfectly cooked squash every time. As I said, I’ve been making spaghetti squash so much this winter. My applications have been both basic (see spaghetti squash and meatballs on the left) and quirky (see spaghetti squash in tacos on the right). I have a bunch of spaghetti squash recipes planned for you this winter that I can’t wait to share. Stay tuned! 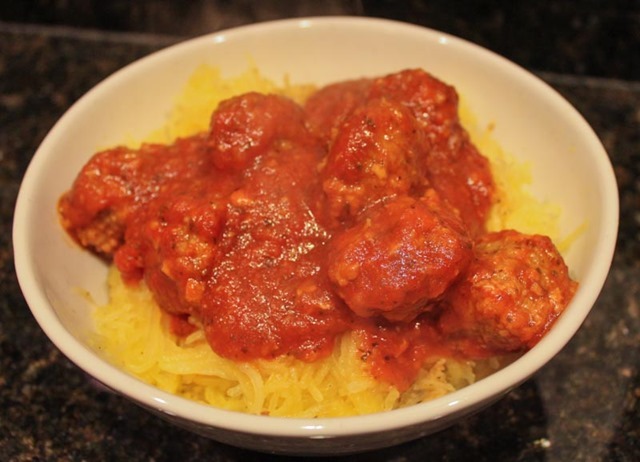 Have you tried spaghetti squash? What is your favorite way to use it? 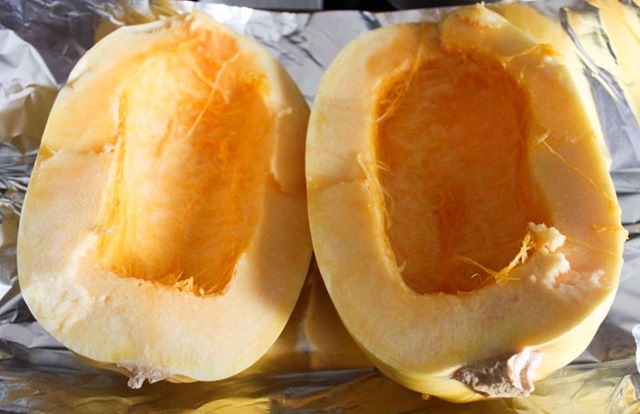 I always microwave for a few minutes before I cut the squash in half – helps a lot! i am late to this post but i want to second this suggestion. you can also score it a bit with a knife before you pop it in the microwave – i do this with acorn squashes which are sometimes cooperative and other times hard as a rock! Oooh, good call – I will have to try that! 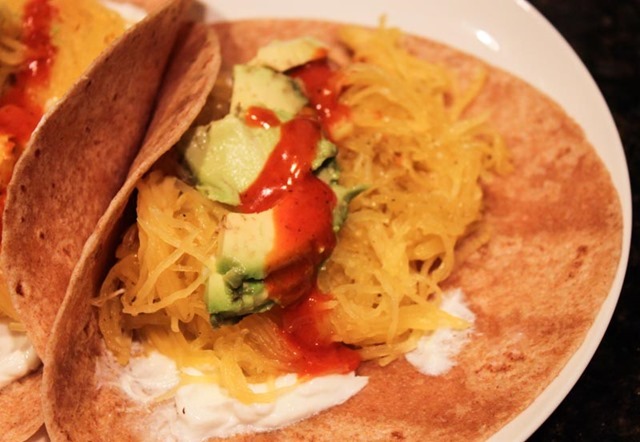 Love Spaghetti Squash! I like it like you made it as a spaghetti replacement. I also like it with just a splash of Bragg’s Liquid Aminos. Simple but good. Nice – I love Bragg’s Aminos! I love spaghetti squash!! It’s a funny food. It makes me laugh every time I cook it. I love it with chicken and some olive oil. Simple yet delish. I know, isn’t it wacky? That sounds super yummy!